Compliance and risk mitigation are becoming the top priorities for CFOs in best-in-class companies. According to the Association of Certified Fraud Examiners (ACFE), an average U.S. company loses 5% of their revenue due to fraud. With frequently changing regulations, complex vendor networks, and fragmented business process, the demand for compliance is rising with renewed focus on continuous controls monitoring. Accounts payable is particularly vulnerable to fraud. Examples are bogus companies, duplicate suppliers, collusion, and check fraud. When compliance and fraud detection become top priorities in your accounts payable organization what actions do you take? What are the key strategies for managing fraud risk and reducing the burden of compliance requirements? What compliance requirements are critical to your industry? Join this webcast to hear a compelling story of an actual fraud case and “what went wrong.” You will also learn examples of the best- in-class compliance practices that have been adopted by today’s forward thinking accounts payable organizations. Lastly, learn how automation can help address compliance challenges and mitigate the risk of fraud. Chris has held senior finance, internal controls, and controller positions at Digital Equipment Corporation, Compaq Computer Corporation, and Hewlett Packard. As a result of her background in internal controls, she was recruited to implement the SOX 404 requirements at MCI (Formally WorldCom). She was the Vice President of Account Management at APEX Analytix and currently holds the position of Vice President of Business Development at Business Strategy, Inc. Besides internal controls, Chris has an extensive background in accounts payable, procurement, payroll, logistics, project management, and financial process and system integration. She holds a B.A. in English, a B.S. 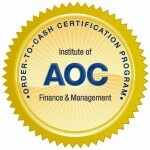 in Accounting, an M.B.A., and a Graduate Certificate in Project Management. She is a Certified Accounts Payable Professional (CAPP) and holds a Certification in Controls Self-Assessment (CCSA) and is a Certified Internal Controls Auditor (CICA). She has been a member of the International Accounts Payable Professional (IAPP) organization for 10 years and is chairperson of the Education Committee, president of the DC, MD, and NOVA Chapter, and is a member of the Strategic Advisory Council. She writes an internal controls column in the AP Matters magazine, is a regular contributor to the White Collar Crime Fighter Newsletter, and New Perspectives published by the Institute of Healthcare Internal Auditors (AHIA). She is also a member of the IIA, IHIA, ISM, and ACFE. Bruno manages the Business Process Automation Solution product line for Canon Information and Imaging Solution. His previous professional experience was in the field of automatic data capture and mobility with Symbol Technologies and Motorola Solutions. Bruno holds an electrical engineering degree from the Superior Industrial Institute of Brussels (ISIB) and an MBA from Long Island University. 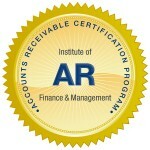 Receive 1 CEU toward renewing APM, APS, APPM or APPS certification from the Institute of Finance and Management! 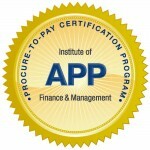 The Accounts Payable Certification and Procure-to-Pay Certification Programs are designed to establish standards for the profession and recognize Accounts Payable and Procure-to-Pay professionals who, by possessing related work experience and passing a comprehensive exam, have met stringent requirements for mastering the Accounts Payable and Procure-to-Pay bodies of knowledge.